Rotherham boosted their Championship survival hopes by coming from 2-0 down to draw at mid-table Stoke. The Millers were unfortunate to trail to first-half goals by Sam Vokes and Sam Clucas, but produced a spirited fightback to move within a point of fourth-bottom Wigan. 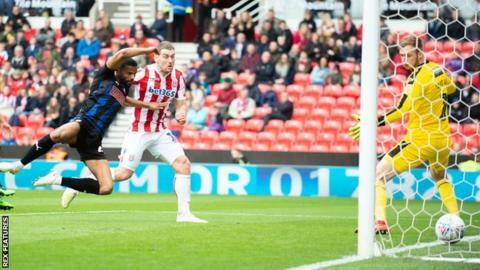 Michael Smith headed home a 58th-minute corner to make it 2-1 and substitute Matt Crooks equalised from close range after Stoke had failed to clear Will Vaulks' long throw. Crooks had a further effort cleared off the line by Stoke captain Ryan Shawcross and was denied superbly by home goalkeeper Jack Butland, who also made fine second-half saves from Clark Robertson and Joe Newell. Stoke were far from their best but appeared on course for victory with two goals in two minutes midway through the first half. Wales striker Vokes headed them in front from an inviting Ashley Williams cross, while midfielder Clucas arrived unmarked to fire in the second from 12 yards. But, having drawn from 2-0 down in the reverse fixture in September, Stoke were on the wrong end of a similar turnaround on this occasion and were fortunate to hang on for a point. Rotherham, who have four games left to play, are sure to pay keen attention to Wigan's game against leaders Norwich on Sunday. "Up to half-time, there were no problems. In the second half, we buckled and that's the worrying thing. "We should have had a penalty from a corner early in the second half, and the second goal is blatantly offside. "Jack Butland was outstanding and showed why he's a top goalkeeper." "It feels a little bittersweet. It was a good opportunity to win a game, we came here to win and I thought we were the better team. "I think my goalkeeper's made one save all day and Jack Butland has made a few more. The fact that he was named man of the match sums it up. "We were desperately trying to get the win we need, but it wasn't to be." Match ends, Stoke City 2, Rotherham United 2. Second Half ends, Stoke City 2, Rotherham United 2. Delay in match Matt Crooks (Rotherham United) because of an injury. Charlie Adam (Stoke City) wins a free kick in the defensive half. Foul by Thibaud Verlinden (Stoke City). Attempt missed. Joe Newell (Rotherham United) right footed shot from outside the box is too high from a direct free kick. Ryan Williams (Rotherham United) wins a free kick in the attacking half. Substitution, Stoke City. Thibaud Verlinden replaces Bruno Martins Indi. Substitution, Stoke City. Charlie Adam replaces Sam Vokes. Corner, Rotherham United. Conceded by Sam Vokes. Corner, Rotherham United. Conceded by Jack Butland. Attempt saved. Matt Crooks (Rotherham United) right footed shot from the centre of the box is saved in the top left corner. Assisted by Ryan Williams. Attempt missed. Matt Crooks (Rotherham United) header from very close range is just a bit too high. Assisted by Joe Newell. Corner, Stoke City. Conceded by Joe Mattock. Attempt missed. Semi Ajayi (Rotherham United) right footed shot from outside the box misses to the left. Attempt blocked. Matt Crooks (Rotherham United) right footed shot from the centre of the box is blocked. Corner, Rotherham United. Conceded by Ryan Shawcross. Attempt blocked. Matt Crooks (Rotherham United) right footed shot from the centre of the box is blocked. Assisted by Will Vaulks. Sam Clucas (Stoke City) wins a free kick on the right wing. Foul by Joe Mattock (Rotherham United). Goal! Stoke City 2, Rotherham United 2. Matt Crooks (Rotherham United) right footed shot from very close range to the bottom right corner. Assisted by Semi Ajayi with a headed pass. Ryan Williams (Rotherham United) wins a free kick in the defensive half. Corner, Stoke City. Conceded by Semi Ajayi. Attempt missed. Will Vaulks (Rotherham United) right footed shot from outside the box misses to the left following a corner. Attempt saved. Joe Newell (Rotherham United) left footed shot from outside the box is saved in the top centre of the goal. Assisted by Will Vaulks. Substitution, Rotherham United. Joe Newell replaces Anthony Forde. Substitution, Rotherham United. Ryan Williams replaces Jon Taylor. Marek Rodák (Rotherham United) wins a free kick in the defensive half. Substitution, Stoke City. Benik Afobe replaces Bojan.